MINNEAPOLIS (AP) For those who think game plans and play calls are complex, it would be helpful to take a behind-the-scenes look at the medical setups that go into an NFL game. The league provided such an opportunity at US Bank Stadium this week, and it was enlightening. From the spotters’ booth upstairs to the exam rooms, locker rooms and ETM facilities in the bowels of the building to the blue tent on the sideline, dozens of people are involved in health and safety protocols. They range from neurotrauma physicians and athletic trainers to data technicians to ambulance drivers and emergency personnel, with perhaps 30 medical folks on the sideline. Even the game referee is a part of the procedures. The league has been criticized for years that it rarely has had player safety and health as a focal point, and it’s placed a high priority on upgrading every such area. Game day includes a pregame meeting, new this season, held 60 minutes before kickoff that involves everybody on the health side of football. ”It’s a big group,” said Dr. Allen Sills, the league’s chief medical officer. That group goes over the Emergency Action Plan, an exhaustive outline that describes who does what in virtually every case of injury or emergency. It’s so detailed that it includes arm or hand signals to help all involved determine what action is needed. ”The collaborative effort between teams is where it should be … seamless and flawless,” said Vikings head athletic trainer Eric Sugarman. The emphasis, of course, is on immediate treatment whenever an injury occurs. 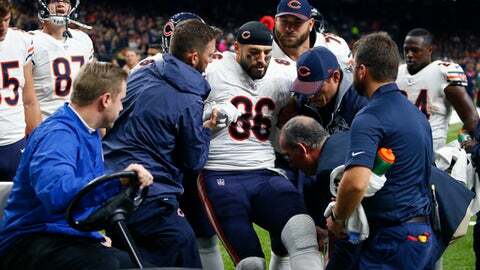 The hour-long meeting’s value became apparent when Bears tight end Zach Miller dislocated his left knee and tore an artery that supplies blood to the lower leg in a game at New Orleans. Miller could have lost the leg had it not been for the quick action by the well-schooled medical staffs. They need to be prepared for injuries large and small, ranging from situations when a visit to the blue tent is enough – a retaped ankle, perhaps – to sending a player inside to an examination room, or even to the hospital for particularly major issues. U.S. Bank Stadium has a specific ”quiet room” for examining concussions – all stadiums must have an area for such exams. Naturally, with revelations in recent years about the dangers of concussions in football, more attention is paid to head trauma than ever. In that ”quiet room” are the unaffiliated neurotrauma consultant and a team physician or member of the team medical staff. They compare the player’s baseline test to his current status. Sugarman said he has never seen a disagreement between them about a player’s condition after the 10-12 minute exam. ”Sometimes, after two minutes you know they’ll fail the test,” Sugarman said. No one from a team – coaches, executives, owners – is allowed into any of the exam areas, not even the blue tent just a few yards away on the sideline. ”I don’t have owners telling me to get him ready … sooner,” Sugarman added. The roles of the concussion spotters have increased in importance and attention after a handful of players, most notably Houston quarterback Tom Savage, clearly were hurt but didn’t get the immediate care required. There will be four UNCs – unaffiliated neurotrauma consultants – at this Super Bowl. Typically, each sideline is staffed by one. After the protocol changed in December following the Savage case, an additional one was added for the playoffs, as well as a centralized UNC based at the league. That central UNC will be in the spotter booth for the Super Bowl. The jobs are usually filled in each city by certified athletic trainers charged with noticing player head injuries from their upstairs booth. The spotters are paired with video technicians who watch the broadcast feed and tag plays that result in injuries – although they’re not always easy to spot. The referee will stop the game when so instructed; Sills estimated it occurred eight to 10 times this season. A sideline monitor then can show video of the play to team or unaffiliated medical personnel. A decision can be made more quickly and accurately about the next steps, if any are needed, and the medical staff has a better idea of what happened than how the player might describe it. Sugarman is more than grateful for the assistance and the technology that makes it possible. Last summer for the first time the league brought together all sorts of medical staffers from each team, plus unaffiliated consultants and spotters for a training session dedicated to head trauma and concussions. Those sessions will continue. Sills bristles when he hears that the NFL is not doing enough regarding head injuries. Standing in a specialized X-ray room underneath the Super Bowl stadium, he vigorously defends the NFL concussion policy. ”I like to say it wasn’t written on the back of an envelope on an elevator ride one day,” Sills said. ”There is a tremendous amount of planning, of study, of preparation, of gathering expert opinion. And frankly, I find it very offensive when people say, `Gosh, the concussion protocol is a joke.’ Because it is a very rare scientific document.